Tired of leaning your fancy bike on your fancy car, or against the wall in your garage? This is your solution. 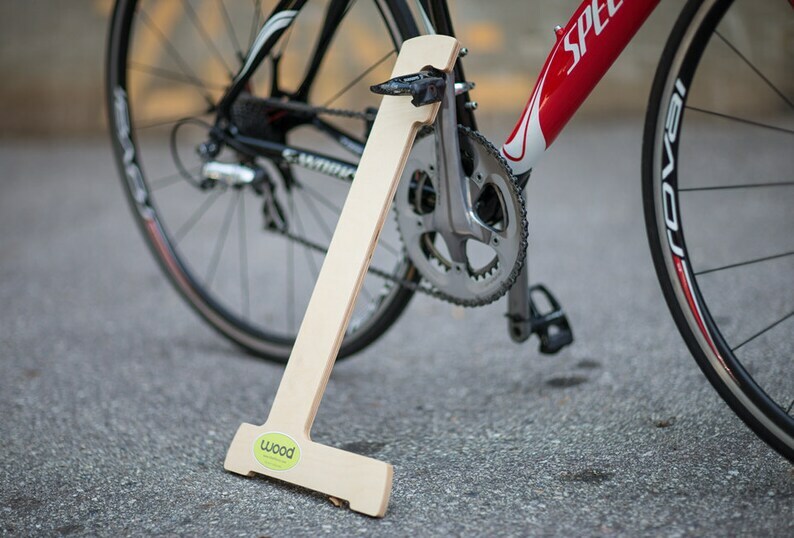 Made of imported baltic birch 12mm plywood, clear coated, CNC machined, wood bike stand, with "Wood" decal. Works with most clips pedals (doesn't work with most platform type pedals), works on any adult sized bike. Works especially well with Crank Brother, Shimano, Exustar, iSSi, Look, MSW, Ritchey, Time, VP, and Xpedo clipless pedals. Requires a pedal shaft size of 3/4" maximum diameter, and at least 9/16" of shaft clearance to fit over pedal shaft. Great and simple product - my Mountainbike loves it. Great craftsmanship!